"The Last Tiger in Haiti"
Whenever I hear 'Haiti' I associate the following: Caribbean, rum, rhythm...poverty. In May, hundreds of people came to Tijuana in search of political refuge in the United States, many of those people are from Haiti. Escaping not only the poor conditions in their hometown but the dangerous ones. It is not a matter of a 'better' life any more. It is the struggle to survive. I have to start with this rough preamble because, it is a topic that is close to us. Around us. And, I am very glad that pieces like "The Last Tiger in Haiti" (written by Jeff Augustin) are being done not only telling a powerful story. But also, making us aware about what is going on. A co-production with Berkley Repertory Theatre, Directed by Joshua Kahan Brody. 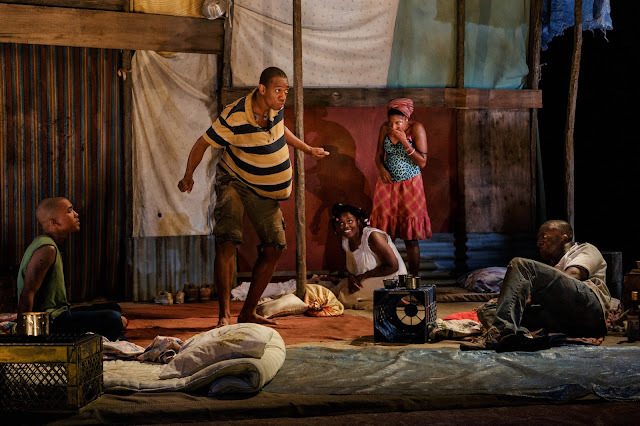 (L-R)Clinton Roane, Reggie D. White, Brittany Bellizeare, Jasmine St. Clair, Andy Lucien in La Jolla Playhouse’s world premiere of THE LAST TIGER IN HAITI, photo by Jim Carmody. We see five kids in the last day of 'kanaval' (Haitian carnival). They are restaveks. Child slaves. The term is french and means 'to stay with' (rester avec). In Haiti when parents do not have enough money to support their children, they send them as servants to households. The conditions are not fair in any way and sadly, different types of abuse come with it. This is reflected in "...Last Tiger..." three boys Max, Emmanuel and Joseph; and two girls, Rose and Laurie. They all share a tent and sleep on the dirt floor living at mercy of 'Mister' and 'Misses', their masters you could say. The means of escape: storytelling. Taking turns to reenact their favorite ones. The rhythm in the play in the first act, goes up and down... Up and down and then settles. One of the stories involves an orange tree. 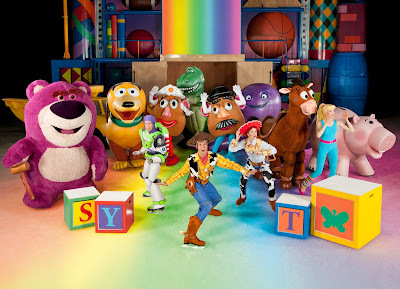 Part of it is narrated in song. I could hear that song over, and over, and over again. That alone, is worth going to see this piece. Music and lyrics by Jay Adana. Laurie (Jasmine St. Clair) is sassy and a rebel. Emmanuel (Clinton Roane) is timid. Takeshi Kata's set design made me wonder off in search for more, during the first act. And, I think that was the objective. Towards intermission we are left with an apparent murder committed by Max. Andy Lucien's interpretation is strong, penetrating the senses and provoking questions. Brittany, Reggie, Jasmine and Clinton make a great team, interchanging the common thread. The only detail that I felt was a little week, was the French Creole accent. I consider it is a hard one to lean/mimic. But still, it felt a bit forced. As charged with energy as the first act was, I was left in the dark. That happens to me when too much is happening and I get lost easily (part of my charm I guess :/ ). The second act is, an avalanche. It comes at you unexpectedly. Kata's design really comes trough alongside Alexander Nichols lighting design. 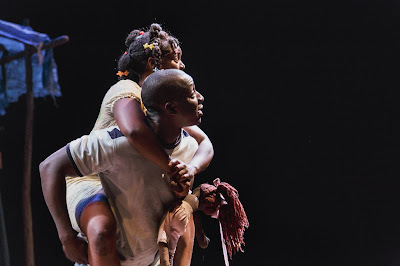 Brittany Bellizeare and Andy Lucien in La Jolla Playhouse’s world premiere of THE LAST TIGER IN HAITI, photo by Jim Carmody. Many years have passed. Max and Rose reunite in Miami. After the 2010 earthquake in Haiti, all the kids lost track of each other. Rose was adopted by an Irish family, and is an author now. She wrote a memoir, but seems critical details were left out. Max is there to set the record straight. Gabriele Greene's role as dramaturg was key. The right elements were combined in order to bring a jaw breaking end that will leave you cold. Even though I consider it tough to digest, pieces like 'The Last Tiger in Haiti' need to be staged and seen. Jeff Augustin is a Haitian-American playwright. One of seven siblings, him and one sister were born in The States. Using the platform to voice matters that, although sprinkled with fiction, are REAL. I urge you to see 'The Last Tiger in Haiti'. Serves you find out what the 'Krik-Krak' is about 'cause I am not telling you! Go see it!